The Barbour Iona Quilted Jacket with horizontal quilt detailing is beautifully versatile with a contemporary twist on the classic quilted Jacket. 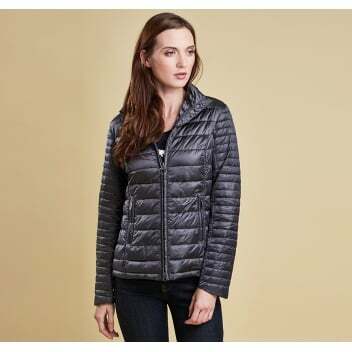 The shorter length style jacket offers a sporty look injected with Barbour's signature features adding true glamour. The simple yet eye catching jacket features a gorgeous hidden feature with the Summer Dress Tartan printed lining adding a super stylish twist. The Iona Quilted Jacket is a lightweight summer must-have.